FILE - A man holds a sign outside of the B.C. Supreme Court bail hearing of Huawei CFO Meng Wanzhou, who is being held on an extradition warrant in Vancouver, British Columbia, Canada Dec. 10, 2018. 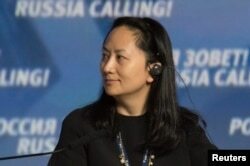 The United States will proceed with the formal extradition from Canada of Huawei executive Meng Wanzhou, Canada’s ambassador to the United States told the Globe and Mail, in a move certain to ratchet up tensions with China. David MacNaughton, in an interview with the Canadian newspaper published Monday, said the U.S. has told Canada it will request Meng’s extradition, but he did not say when the request will be made. The deadline for filing is Jan. 30, or 60 days after Meng was arrested on Dec. 1 in Vancouver. Meng, the daughter of Huawei Technologies Co. Ltd. founder Ren Zhengfei, was arrested at the request of the United States over alleged violations of U.S. sanctions on Iran. She was released on bail last month and is due in court in Vancouver Feb. 6. On Tuesday, China demanded the U.S. drop its request to extradite Meng. Meng Wanzhou, executive board director of the Chinese technology giant Huawei, attends a session of the VTB Capital Investment Forum "Russia Calling!" in Moscow, Oct. 2, 2014. Relations between China and Canada turned frosty after the arrest, with China detaining two Canadian citizens and sentencing to death a Canadian man previously found guilty of drug smuggling. The Canadian Justice Department did not immediately respond to a request for comment outside regular business hours. Canada is one of more than 100 countries with which the United States has extradition treaties. Once a formal request is received, a Canadian court must determine within 30 days if there is sufficient evidence to support extradition, and Canada’s Minister of Justice must give a formal order. In an article published Monday, a former Canadian spy chief said Canada should ban Huawei from supplying equipment for next-generation telecoms networks, while Canada’s government is studying any security implications. Some of Canada’s allies, such as the United States and Australia, have already imposed restrictions on using Huawei equipment, citing the risk of it being used for espionage. Huawei has repeatedly said such concerns are unfounded, while China’s ambassador to Canada last week said there would be repercussions if Ottawa blocked Huawei. In Monday’s interview, MacNaughton said he had complained to the United States that Canada was suffering from Chinese revenge for an arrest made at the U.S.’s request. Canadian Prime Minister Justin Trudeau previously said China was arbitrarily using the death penalty and called on world leaders to raise concerns about the detained Canadians.